The low-level aqueduct is about 3 miles [5 km.] long. 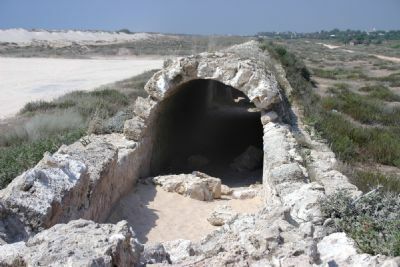 It extended north to the Zarqa River which had been blocked by a dam, behind which the water collected to feed this aqueduct. It was most likely constructed in the fourth or fifth centuries A.D. It was built of sandstone, coated with plaster, and covered with a vaulted roof measuring around 6 feet [2 m.] high to prevent the sand dunes from clogging it.